Place of Death: Benedict Canyon, Los Angeles, California, U.S.
Sharon Tate was an American actress and model. She was the daughter of Doris Gwendolyn (Willett) and Paul James Tate. She was married to film director Roman Polanski. Sharon was brutally murdered by members of the Manson family at the young age of 26. She was pregnant with her and Roman’s son at the time. Sharon lived in Italy for some time, and spoke Italian. Sharon’s documented ancestry included English, Scottish, German, and Swiss-German. She was also said to have Irish roots. It is not clear if that is accurate. Sharon’s paternal grandfather was George N. Tate (the son of Charles Coleman/L. Tate and Delia/Della Florence Latham). George was born in Alabama. Charles was the son of Christenberry Lee Tate and Amanda Jane Cudd. Della was the daughter of Cornelius Crawford Latham and Lucy Harris. Sharon’s paternal grandmother was Grace Cleveland Odom (the daughter of Milam Monroe Odom and Ella Lee “Eliza” Britt). Grace was born in Texas. Milam was the son of Albert Monroe Odom and Louisa Cole. Ella was the daughter of James Boykin Britt and Penelope Demsy Thompson. Sharon’s maternal grandfather was named Dorris W. Willett. Dorris was born in Texas. Sharon’s maternal grandmother was Mary Fannie Leuch (the daughter of Daniel Leuch and Amanda Adeline Helm). Mary Fannie was born in Texas. 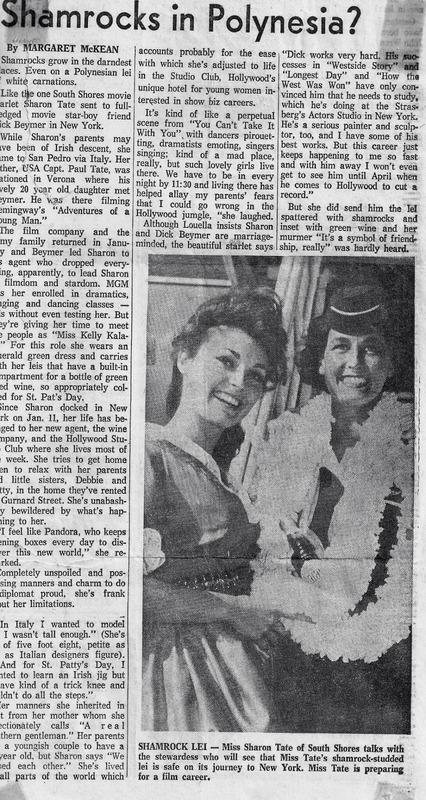 1963 article on Sharon and her family saying “While Sharon’s parents may have been of Irish descent, she [moved] to San Pedro via Italy”. Can you use it here? That can’t be her grandfather. Her mother was born in 1924.
on Sharon’s father’s side, are all those surnames English or Scottish or possibly Irish, Scots-Irish? Harris, Scruggs? Latham is Scandinavian apparently.